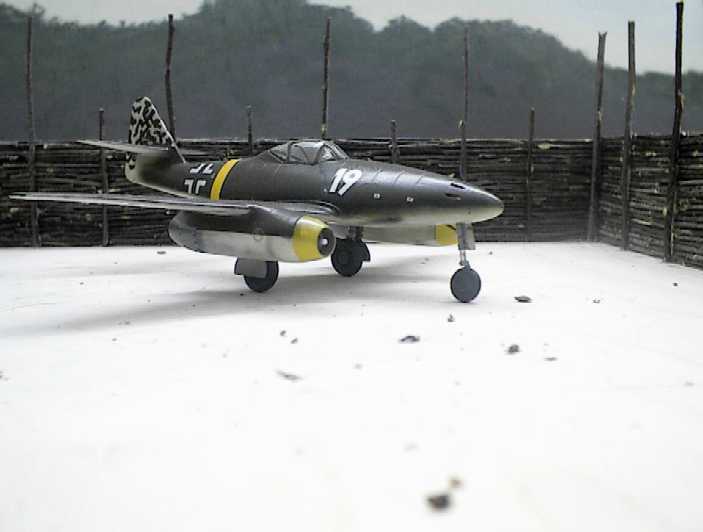 My third diorama article suggests a different background for photographing or displaying your models. This complex project was inspired after flipping through books with original wartime pictures. You will find many such pictures in the Squadron "In Action" series or comparable references. The major inspiration was Axel Urbanke's "Green Hearts" book. 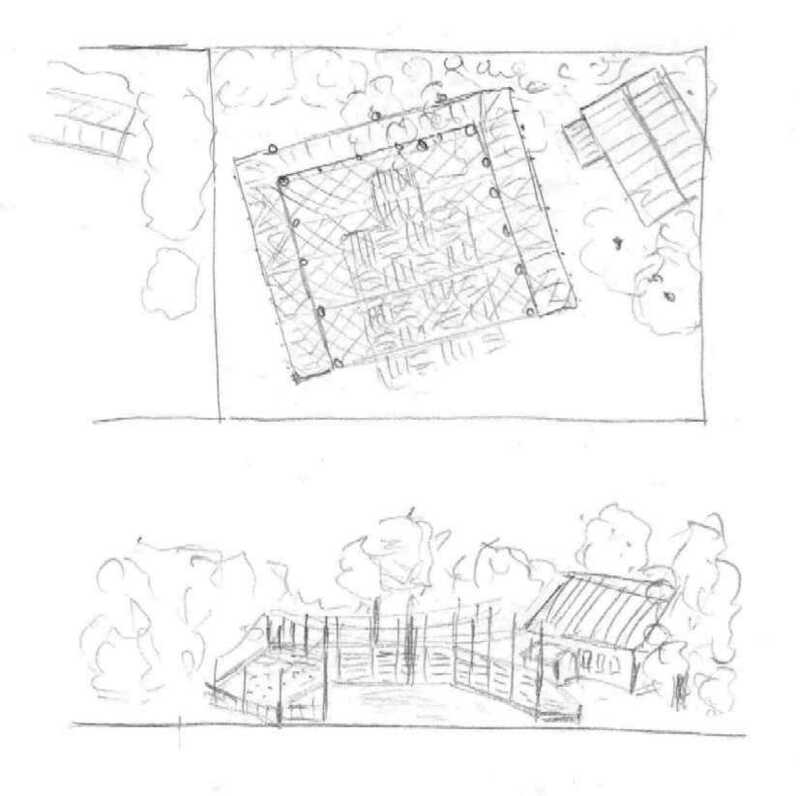 It contains some pics about a scene very near to the photo above: A wooden revetment made of trunks with camouflage nets and some large farm buildings in the background located at Hesepe (near Osnabrück) in the north-west of Germany. The challenge was how to depict the camouflage nets and if it was possible to achieve a "natural" look. The result looks good to my eye, but it's up to you to judge. 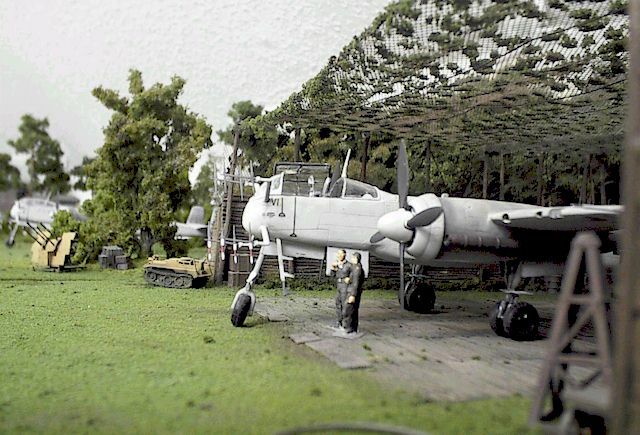 This diorama is not for novices. You will need a lot of time and patience, and you will have to use your experience as a modeller. The key to a realistic result is always to study lots of original pics, and take time to consider how to approach the work. One question may be: "What scale"? 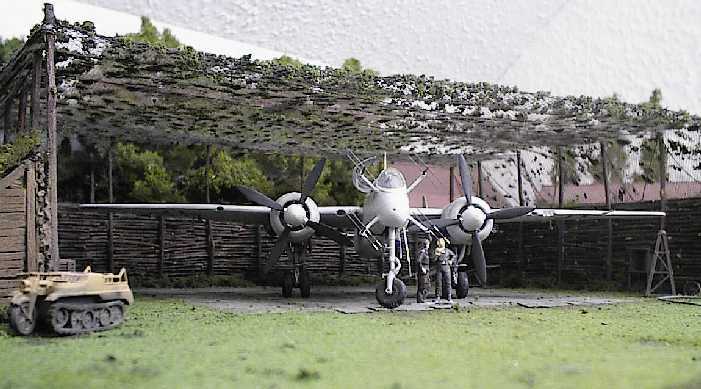 A shelter box for single-engined fighters can be much smaller than one for twin-engined aircraft. If you depict a temporary used airfield, a little mound of earth may be enough. Durable works will be made with wooden planks or other more permanent material. 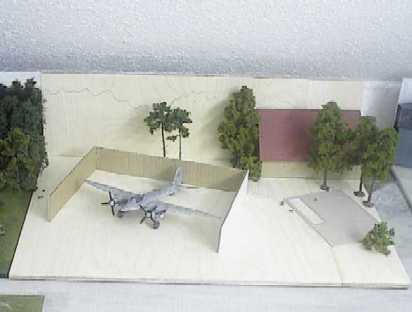 The concept was to make an addition to the existing airfield diorama (See Part One of this series). 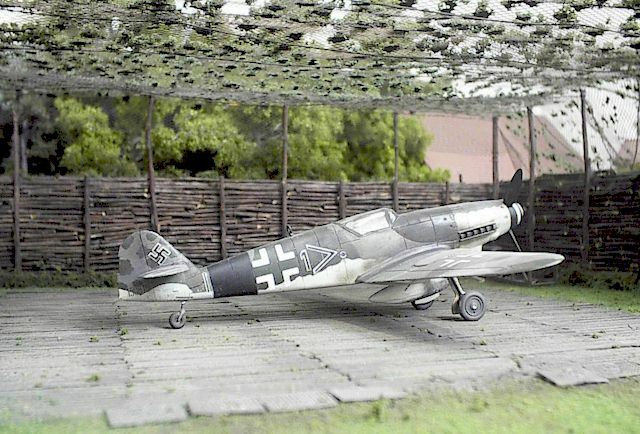 To depict larger twin-engined a/c, I tested the scene with a Ju88-class model. As always, I tried a design that does not follow the border lines of the base. I decided to use an angled position of the box, although it doesn't leave much space to the leading edge of the base. Although this may limit the photographic angles for the scent, most shots will be "frontal" into the box or in angled positions anyway. Nevertheless, I HAD to try it. 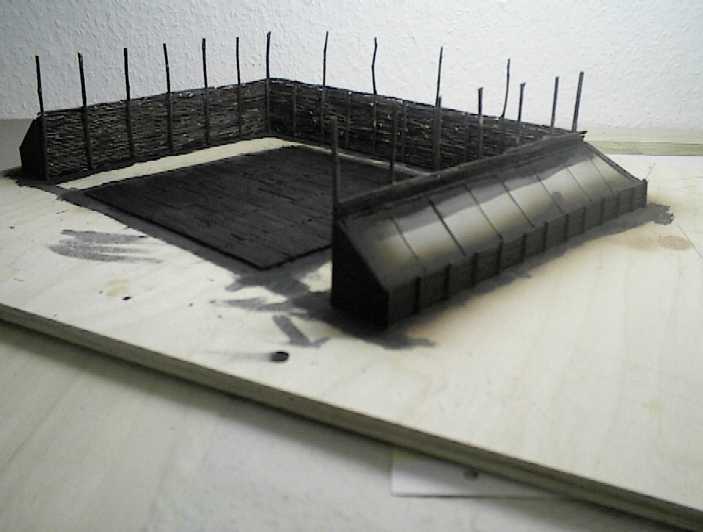 During the test I found out that my base plate (45x55 cm) was too small to depict the buildings on the right of the shelter box. I had bought base material for two projects so I could offer up 45x12 cm from the second one and extended this base plate to 45x67 cm. Besides the camouflage nets this work was the most challenging part. My first idea was to do it with wooden matches. But to do the inside and outside in this style seems to be boring to me. It had to be the trunk-type! So what to do? Toothpicks wouldn't work - not very "real" looking. The solution came at the local shop for farm equipment: I saw a broom of birch branches - a traditional tool. The fine branches (down to 1 - 1,5 mm diameter) were ideal for this work. 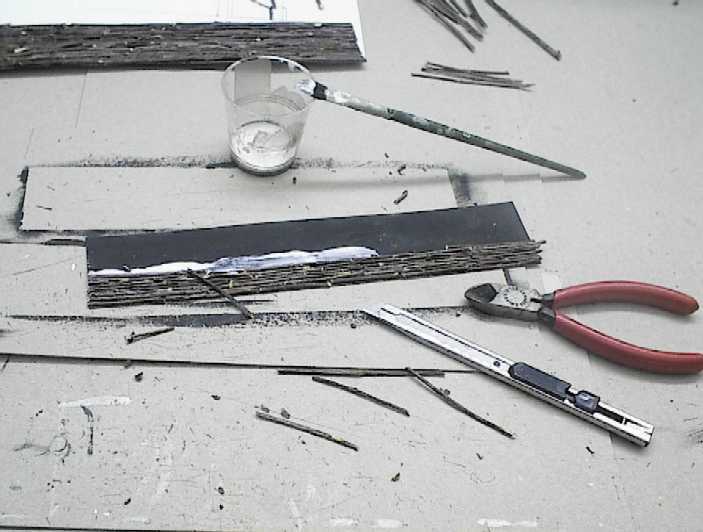 But what a lot of work - it took HOURS to glue these small branches to the black painted card-board with white-glue. The thin elements were hot glued on thick cardboard, which was also hot glued to the base plate. The above test photograph also shows the prepared background: The plywood was painted light blue and black first. The upper edge of the black area was altered with dark green shades of artist pastels. The sky was also finished with my Rembrandt pastels (Netherlands). This next step was not as complex as the inner part. A small barrier was to depict with wood planks to hold back the outer earth cover of the box. This was done with sawmill equipment from Faller (Model Railroad). The angled wall was done with thin card-board, applied with hot glue again. Then it was time again for some boring work: Several hundred match sticks were to be glued into the center of the box. You can see the results (above) sprayed in dark brown, but not yet weathered. Although not described in detail, there was a lot of work to do to modify a "Coal Store" kit from Vollmer Railway to the desired result. 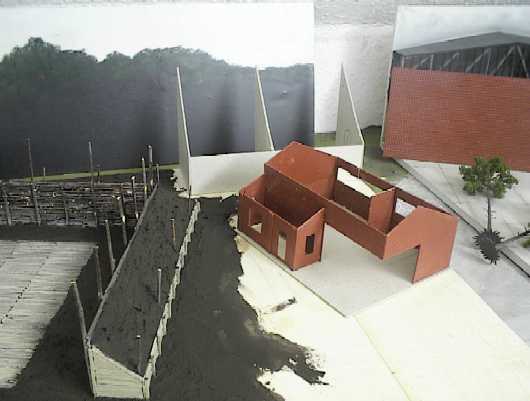 The large farm shed was built using thick cardboard for the basic structure, covered with Vollmer brick and roof plates. You can see some of these elements half finished on the following pictures. The next step was to do the putty work for the ground. I prefer my mixture described in part one of this series of articles: Cellulose powder, white glue and solid colour paste. 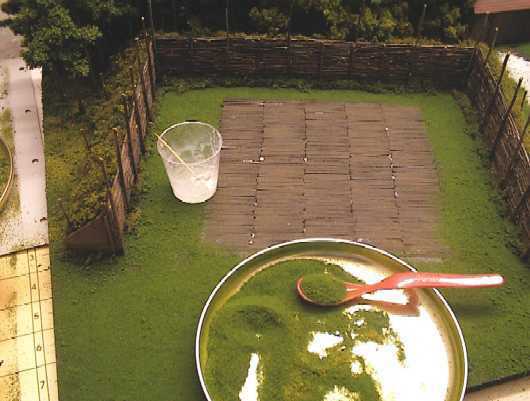 To apply vegetation (mostly Heki or Woodland Model Railroad stuff) I used white glue mixed with dark brown colour. Some areas were applied higher, some lower to get a natural effect. Here we reach the final work on vegetation: All of those expensive trees were applied with hot glue. At this point I had put some white glue between some planks with a toothpick so I could attach some grass. Now it comes to the showdown. I bought some fine net for gift wrap at the local fancywork shop and sprayed it in dark brown. To get it to over the box, I had to tighten holders of 0,3 mm copper wire. I started at the back and worked to the front. The nets were carefully stretched over the holders and fixed in place with knots of 0,1 mm copper wire. The result was sprayed again to hide the shiny copper wire. The last step was pretty easy: I applied little dots of white glue on the net and scattered leaf material over it in stripes. Excess material was removed with a vacuum cleaner. I would like to present two time-consuming projects I finished in the fall of 1999. The Heinkel He219 "Uhu" in two variants. The first photo shows a heavily modified DML Kit. It is the prototype V18 that was used for engine tests (Jumo 213, Jumo 222) and had four-bladed props. The camo scheme is a little bit speculative: A grey-typed RLM 76 as base colour, with very faded RLM 75 shades. Many thanks to my friend Mikhail Poutnikov from Russia for the Equipage real rubber wheel set!! On the next pic, the other UHU, G9+DH from I.NJG 1 is to be parked into the shelter box. The camo scheme is well documented and was the result of several attempts. The full-sized picture may be viewed by clicking the thumbnail to the left. And finally a small one. This is the Revell/ProModeller Bf 109G-10 of JG53, Decals by Aeromaster. If you are not afraid of a lot of boring handiwork, try this type of project. The result was a lot of fun for me, and allowed me to present my models on an unusual stage. Maybe some of these techniques will be of interest to armor modellers, because many of the techniques can be useful for AFV subjects too. The next instalment of this series will be a hangar type again, this time the INSIDE, with removable walls to allow different angles of shots.